Bloody good might be a mole if it were not for the irritation in the fragrance - inappropriate notes of manure and rot, cooked vegetables destroy the balance and unity of style, which, as we shall see later, in taste / finish merge into a beautiful citrus-fruit extravaganza of freshness and fun. Despite the obvious drawback, in general the product deserves a very high appraisal, depth and richness, excellent work with the fortress, vivid character and a lot of positive impressions of the tasting - all this can be found here in large numbers. Open, warm, woody-grain with notes of dried fruits, dry processed wood, grains, light rot shades, boiled vegetables, manure, cooled porridge, dried apples. Fresh, dense, dried fruits, citrus-pepper wave, orange and lemon peel, red orange, mandarins, kumquats, sweets, very sweet and rich, a lot of oak, in the background light notes of raisins, overripe tropical fruits, lacquer notes, flower-honey tone, lemonade. Light, subtle, faint echoes of citrus bacchanalia of taste, fruit compote, light notes of ginger and orange, a little spicy oak, menthol, camphor, leavened notes. Very nice sweet / spicy / sour ratios. honey and caramel, plum. Ginger and pepper. Long. Cinnamon, apple and cocoa. With water its gets sweeter but more than a few drops and it falls away so no more than a few. I liked it, a fresh one and a change to the heavily sherried versions. Not very expressive on white fruits mixed with a little fresh pineapple, there are also a few cleaning fluid notes. Left in the glass it improves and the pineapple notes increased and then joined by honey and possibly a little yellow plum. What I would call light & fresh. Creamy mouthfeel, zesty & lively with some lemon sherbet fizz on the tongue. Its quite sweet on lemon cream biscuits, puff pastry and wafer but its also quite dry after a while. Approaching medium, and still on the sweet side, pleasant mouthfeel. Not the most straightforward 25 yo dram. It has it's own mind, but once you've got to know it, it's good. Must be re-refill or even more extreme. After all these years, it's very much spirit driven, with pear drops and plum eau-de-vie. Not that it's not nice, just something you wouldn't directly expect from a 25 year old whisky. Further, there is vanilla, lemon, a slight mineral touch of stone, and grassy barley. Spicier and much fuller than on the nose. Fresh plums, creamy vanilla, honeyed barley, some licorice root and quite some ginger. Behind this all, the spirity undertone stays present. Gets rather dry, on ginger, unsugared cinnamon, cacao, and lemon zest. Next to that, there is some weight from the malt and licorice. Not very complex but tasty Stathisla. Sample from MaltMartin. Vanilla, citrus, malty and some fudge. Full with bitter citrus notes - lemon, warming spices and caramel. Fresh, some liquorice, apple and almond paste. 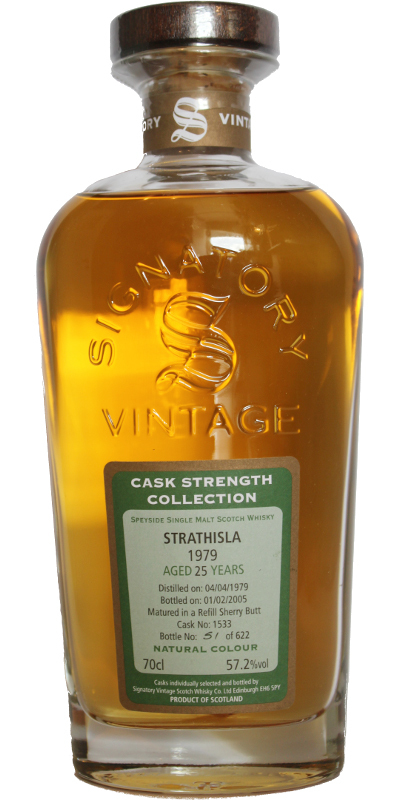 For me a very good Strathisla on which you are always happy!